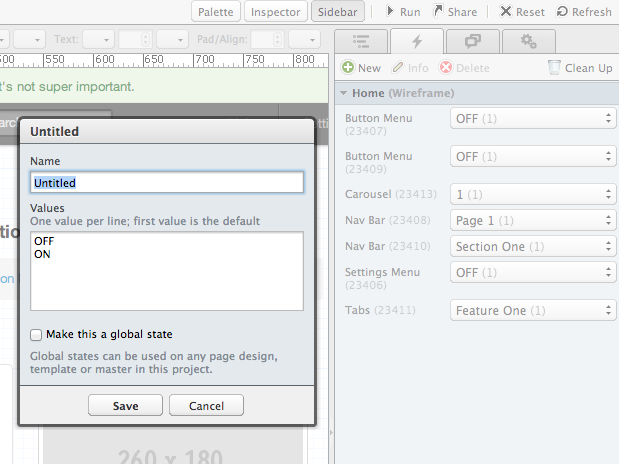 You can create states two ways: using the States tab in the Sidebar and using the Actions properties. The steps are the same in each case. However, creating states using the Actions properties is sometimes more efficient because you can immediately assign a state value to the property. 1. Open the States tab. Click the Sidebar button in the Editor toolbar and click on the lightning bolt icon to activate the States tab. Click the New button in the States pane. Specify the name and state values. The default values are Off and On. You can specify any number of values and assign them any label. The first value in the list is the default value, and is used when the design first loads. As shown below, a new popup state will be created with default values. Note that a unique numerical ID is automatically assigned to all states. When creating or updating a state you can choose the make the state global. A Global state can be used by any Design or Master within the project. This is convenient when you need a state to retain its value across your entire project. For example, you might create a global “Logged In” state, and a master that displays a special set of controls when it is set. You could then use this master on any Design in the project, and it will always reflect the current “Logged In” state when navigating between designs in Review ( or the HTML Export ).